MINNEAPOLIS – The popular image of sub-Saharan Africa is usually a hungry child standing in a dust- and dirt-floored hut. During my time in South Africa over recent months, I witnessed something different. In the bustling cities of Johannesburg, Cape Town, and Durban, life did not conform to that picture of want and poverty that so often comes to mind. Life on the whole, of the entire population, was not so dire – or it was at least played out in a different context. More luxury Mercedes and BMW cars passed us on the freeway near Joburg than would on a given day driving down the I-95 to New York City – and this was despite the prohibitive import tax that would have made those cars even more expensive – evidence of the riches that some South Africans clearly possessed. 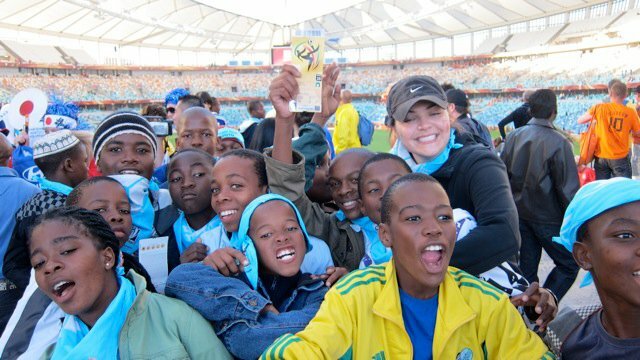 South Africa has the most developed infrastructure of any of its sub-Saharan neighbors, even more so now because of the expansion and refurbishing that took place in preparation for the World Cup. Being more developed, the country has a particular brand of urban poverty, rather than the rural variety that many Americans associate with the area. Places like Kliptown and the squatter camps outside of Joburg are full of people chasing the mirage of urban opportunity, an illusion that evaporates only to reveal rampant unemployment, scarcity of unskilled jobs, and thousands of others just like them pursuing the same dream. “The rich get richer, while the poor get poorer.” It’s a familiar, age-old saying – overused, maybe, but the reason for its endurance is that there is some truth to it. The gap in wealth, resources, and quality of life is astounding in South Africa. Near Mtubatuba, my place of residence during a one month+ stint of employment, the view of Africa as epitome of desolation and pinnacle of poverty was contradicted simply by the landscape. I was surrounded by lush vegetation, much of it part of the industrial farms that produced gum trees and sugar cane for the local paper and sugar mills. Poverty in South Africa was not worse than I expected. Near cities, in tightly packed rows of ramshackle housing, life seemed more desperate than it was in the countryside – perhaps the idyllic setting of rural areas tricked me into an unrealistically rosy perception, or the fact that misery was never as concentrated there as it was in highly populated urban townships. The “township tours,” which show off poverty in order to make a profit, are popular attractions for foreign tourists. They make me uncomfortable, in spite of the fact that some of the money goes to people in need who might have no other source of income. I feel that I should avert my gaze, rather than risk offending or shaming them, but I wonder how much of this sentiment comes from a sense of impropriety, and how much from a desire to push the bad/struggling parts of the world aside so that I can continue living my comfortable life and attending Yale University. Does merely raising awareness of conditions of need, whether it’s in South Africa or somewhere closer to home, lead to improvements? There must be more. The other day, I heard a man say that the problem with direct service is that there will always be more to do, another person to help. Maybe the best way for me to help, at least for now, is to get involved in groups that can have a long-term impact on situations like those in Kliptown, South Africa. Or maybe that’s just the easy way out. 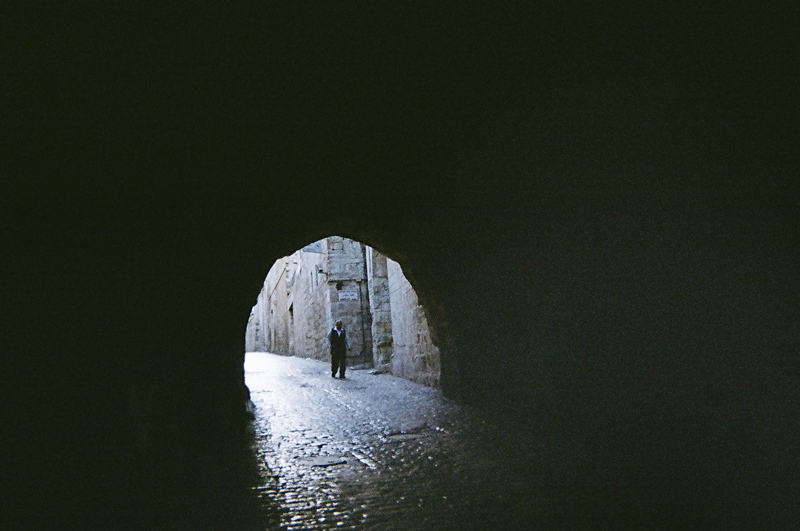 JERUSALEM—My last days in Jerusalem left me far from comfortable. I saw many infuriating things, but one that especially sticks out in my memory was actually one of the most benign. As I wandered around the Old City, I saw one young Jewish boy with a kippa and payot on his bicycle and two Palestinian boys with sticks. As I walked, the back-and-forth taunting intensified. They must have been 7 years old, and they faced off on the empty stone street. They backed away from each other, and they all seemed to be waiting for the other to make the first move, just as their respective leaders always seem to in peace talks. Eventually, my comrade scattered the kids, but I couldn’t help feeling defeated. They were so young. The mutual hatred and fear felt inevitable. This one moment may be insignificant; kids fight all over the globe. But it did fit in with the plethora of hopeful and discouraging experiences I had over my ten weeks in the region. Now that I’m home, it feels appropriate to write “concluding thoughts,” or something along those lines, but my thoughts so far have been anything but conclusive. I left the Ben-Gurion airport—after spending four hours in priority security procedures because of a Palestinian kafia and documentary on the West Bank found in my bag—feeling a web of contradictory emotions. After witnessing the numerous injustices in East Jerusalem and the West Bank, I could not help feeling anger. I felt anger for the man in the town of Siswaya whose village shrunk from 500 families to 43 as Israeli forces filled their caves and settled their land. 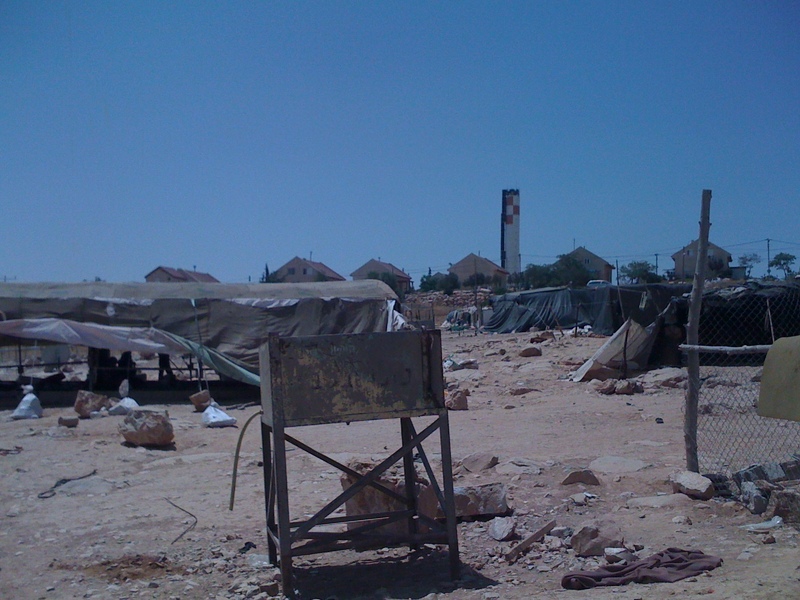 I felt anger for the Bedouin village of Umm al-Kheir in the West Bank, where even out houses are demolished by the Israeli government, when yards away red tile roofs and cookie cutter houses mark the settlement Karmel next door. I felt anger for the disproportionate distribution of resources in the “united city” of Jerusalem. I felt anger for the checkpoints in the city of Hebron, where settlers cut down Palestinian olive trees and videos reveal settlers attacking Palestinian schoolchildren and even the aid workers there to protect them. I felt anger for these and many more injustices, but this is not the whole picture. I went dancing in Ramallah, a thriving city in the West Bank. I even visited a hilltop, caravan settlement in the desert of the West Bank, and was welcomed with open arms. 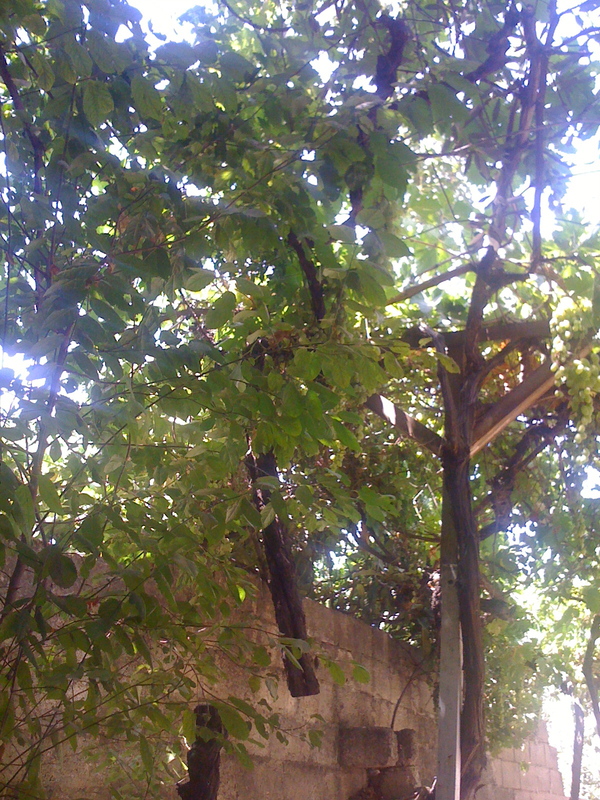 And I love so much of Jerusalem: the shuks and the suqs, picking figs and rosemary on my walk home, the hidden gardens, watching tourist groups at the various holy sites, the quiet of Shabbat, the mix of sugar and sage in Bedouin tea, arguments of who serves the best hummus or falafel, and the excitement of living somewhere in the paper almost every day. 1) Show Americans what their government is supporting. This isn’t a distant conflict that Americans can claim they have no place to meddle in: our tax dollars fund many of the atrocities I saw. The Israeli army protects the settlers in the West Bank, and don’t protect Palestinians when these settlers use violence against them. While many Israelis claim that these settlers are extremists and terrorists, they cannot be so ostracized as long as Israel continues to protect them and sponsor their continued development. As long as Israel is supporting them, so is America. 2) Encourage constructive criticism. As an often-fierce critic of Israeli policy, I have been stunned by and unhappy with much of the criticism I hear in America. This is not a one-sided conflict by any means, and in order for a viable peace to be possible, both sides and perspectives must be recognized as legitimate. One frustrating criticism I have encountered is gaffs at Israel’s security claims. Israel does have security concerns, and while I disagree with many of the actions done in the name of security, the answer isn’t to dismiss the fact that there are security concerns. Outright criticism is not helpful. The situation is complex and deserves no one-sided oversimplification. 3) Don’t speak about Israelis as one unit. As with any society, there is a wide political spectrum in Israel. Further, the civil society is more vibrant and active than I’ve ever witnessed. From soldiers who give lectures and tours about their experiences in the occupied territories, to the weekly protest of the settlements in Sheikh Jarrah, to the women of Machsom Watch who watch over the checkpoints in the West Bank each day, to the bereaved families on both sides who discuss their loss together, the variety of organizations working towards peace are numerous and differ in strategies. Even for opinions I don’t support, there is a plethora of organizations working for change. 5) Keep learning, and talk to people. This conflict, like most, so easily becomes numbers and figures, and thus dehumanized, but any “solution” from the top would be futile if the situation on the ground remained the same. The other issue with the media portrayal of it often depicts it as hopeless and never-ending, but being there and witnessing the constant agency warrants hope. Hearing from the people who experience the conflict day in and day out reminds me that peace and coexistence are possible. At least talking to some people does. As time puts more distance between me and those enlightening months, maybe I will have more definable goals or conclusions. For the time being, I will keep learning, keep an open mind, keep hope, and encourage others to do the same. Jerusalem is the most fascinating city I have ever been in, and I hope to find myself in this region again soon. NEW YORK—Although Parliament was officially in recess, my last week working in Westminster was one of the most exciting for my office. On Friday, Prime Minister David Cameron announced that he wanted to introduce term limits for those who live in council homes. Liberal Democrat voters – many of whom live in council homes – were furious, and everyone wondered how Liberal Democrat Deputy Leader Simon Hughes (the MP for whom I work) would react. Would he go along with Cameron’s proposal and risk alienating thousands of voters? Or would he criticize the prime minister and risk creating a rift in the coalition? Eventually, he made a statement that was calm and firm. While he said he would support further discussion on council home terms in government, he made it clear that fixed term housing was neither a Liberal Democrat policy nor one he favored. From Twitter feeds and media headlines, it quickly became clear that Simon Hughes’s statement resonated with Liberal Democrat voters, who were happy to see one of their politicians standing up to Conservative policy. This support came at the right time. As the above graph indicates, Liberal Democrats are the only party to have suffered a loss in popularity after this year’s general election. This trend is likely the result of two factors. First, as is the case with any opposition party who has become part of government, the Liberal Democrats have had to make some tough policy compromises. This is especially tough for a third party such as the Liberal Democrats, who have been in opposition for the better part of a century and whose constituents therefore are far less willing to tolerate even slight policy adjustments. Second, the nature of the coalition alliance has also alienated Liberal Democrat voters, who do not understand why their party has had to ally with long-time opponent Conservatives. Additionally, Labour and the media have successfully portrayed Liberal Democrats as the weaker half of government. It is no surprise, then, that many Lib Dem voters wonder what their party is doing for them, particularly in light of harsh governmental public spending cuts that – as I have said previously – affect Lib Dem and Labour constituencies the most. What, then, can still save the Liberal Democrats? First, as Simon Hughes did last week, Liberal Democrats should not be afraid to stand up for core values whilst in the coalition. Of course, compromise – especially in a coalition – is necessary and often preferable. But Liberal Democrat politicians must take care to highlight their role in shaping policy. Otherwise, they risk losing more voters than they already have. Second – and perhaps more importantly – Liberal Democrats are hoping that next year’s referendum on voting reforms will be successful. Liberal Democrats hope to implement the Alternative Vote system, in which voters rank candidates in order of preference and the candidate with a majority of first-preference votes wins. If no candidate secures a majority of first-preference votes, second-preference votes – and later, if necessary, third-preference votes – are taken into account until someone obtains a majority. The proposed reform will not only make elections more democratic by taking into account everyone’s preferences, but it will also give Liberal Democrats a larger share of the vote. Under the current system, Liberal Democrats are severely disadvantaged. As the New York Times reported after the general election, Liberal Democrats received nearly 25% of the popular vote but less than 10% of the seats in the Commons. A successful referendum on AV could very well make up for the pains Liberal Democrats have felt thus far. In the end, although Liberal Democrats walk a difficult road in the years ahead, they also have a chance to effect real change. For although being in government invites criticism and blame, it offers something else opposition does not: real power. And while I am now back home in New York, I know I will follow the next five years of British politics with great interest. SOUTH AFRICA – This is a country full of contrasts, where first world and third world rub together every day. In Soweto, an area called Diepkloof Extension is full of houses that wouldn’t seem out of place in Beverly Hills – but just down the hill are blocks of government-built housing that have no running water, and where the only electricity comes from car batteries. Many of the domestic workers, lawn mowers and other laborers who maintain Diepkloof’s pristine appearance live in this poor area, and trudge through the grass each morning to start work. Life in South Africa is not monolithic, and the same can be said about the tournament it recently hosted. I discovered this summer that you can go to two World Cup games and have completely different experiences. My trek up to Rustenburg to see our boys of team USA take on England was hectic. We woke at daybreak and drove 500 km to Johannesburg, rushing to beat Joburg’s notoriously bad traffic, on the way to the stadium. The game was going to be my first ever professional match, excluding the semi-pro Minnesota Thunder games that I went to as a kid, where tickets cost $1 and I played soccer alongside the field. My ticket was waiting with a friend, who I needed to find en route to Rustenburg, somewhere along the main highway. The plan went as follows: drive over the huge dam, continue past a busy market on the left-hand side of the road, and find the sign for the elephant sanctuary. Wait and pray. Difficulties connecting with my friend and signs that read “Danger: Hijacking Zone next 6 km,” meant that we eventually decided to meet at the stadium. When driving to World Cup games, the best option for non-VIPs is the Park & Ride. You leave your car at a lot, far away from the stadium, and take a shuttle up to its entrance. Rustenburg’s version of this was a large grass field with a vague sense of rows and an even more elusive sense of order. Unable to navigate any further through the dense traffic of bodies and buses, our shuttle driver let us off a kilometer away from the stadium. We joined the mass of fans flowing down the dimly lit street. After all the talk of the damage that thousands of vuvuzelas could wreak on our ears, I wasn’t surprised to see a group of boys hawking earplugs along the road – if they hadn’t undertaken that business venture, I certainly would have tried. The confusion continued inside the stadium. The ushers, volunteers in bright green FIFA jackets, sent my friends and me back and forth to different levels of the park, refusing to allow us past so we could take our seats. We finally convinced/fought our way through in time to see Tim Howard jog off the field at the end of warm-ups. The game itself was a messy affair. Team USA’s defense was lax, and the back line let Steven Gerrard through almost immediately to give England a 1-0 lead. Neither side managed to really dictate the style of the game, and Dempsey equalized towards the end of the first half, thanks to a horrible error by the England goalkeeper. The USA supporters jumped up and embraced each other, while Englishmen around us groaned. It seems that Americans can think of no better cheer than “USA! USA!” repeated over and over – at least they shout it with pride. Our more inventive counterparts from England have a large repertoire of profane chants and songs, but to my disappointment they were drowned out by the vuvuzelas. Neither the stadium scoreboard nor the clock was working, but it didn’t matter. 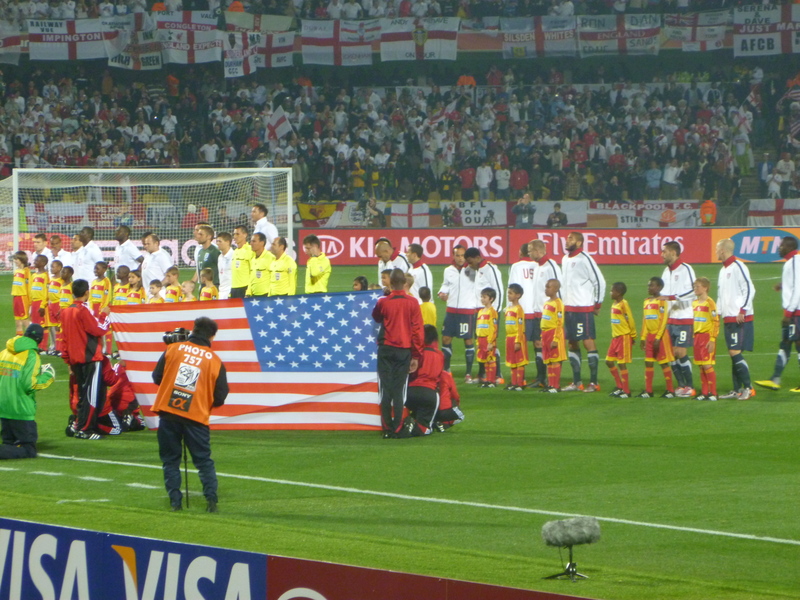 The final score was England 1, USA 1, and the American players and fans seemed satisfied with that result. One player in particular was enjoying the limelight, grinning and waving back to the crowd while his more seasoned teammates tromped back to the locker room. As my friends and I regrouped and went back to our car, our post-game high soon evaporated. The park & ride had just one exit, and with cars descending from all angles the going was slow and exasperating. Further ahead, an endless string of red taillights wound through the night. Luckily for me, I dozed through most of the traffic, only rousing myself enough to stumble inside and unroll my sleeping bag when we returned to Johannesburg. It was 4 AM. I lay down, hoping to get some rest before the next morning’s long drive home. The match that took place on the following Saturday between the Netherlands and Japan, on the other hand, was well-organized, clean, and beautiful. Moses Mabhida is the most picturesque of the ten World Cup stadiums, with an elegance that Rustenburg lacks. It’s in Durban, where 80º F temperatures belie the fact that Africa is in the dead of winter. Even chaperoning nine kids from the Mtuba Football Academy, the experience was easier and less stressful than going to the game the previous weekend. We parked, went through security, and found our seats without incident. Around us, the stands began to fill with swathes of orange and blue as more spectators arrived, decked out in their country’s colors. It was easy to tell which team the marching band, sporting neon orange tuxedos, and the guys in full-body orange spandex, were supporting – the Oranje (a common nickname for the Dutch team) enjoyed the majority of the support that afternoon. Japanese fans wearing strange get-ups resembling large bowling pins milled around excitedly. As for the man in a gaudy oranje kimono, I’m still not sure exactly where his loyalties lie. The teams played a calm, mid-afternoon game, in which the Dutch passed the ball around with ease and established a fairly laconic pace for the match. Despite their differences, these games shared a sense of companionship that characterized the entire World Cup. In both matches, I was struck by the lack of animosity on the pitch and in the stands. Referees gave only a few yellow cards, since hard tackles and other displays of poor sportsmanship were rare. The England fans sitting next to me were good-natured, even managing to laugh off ‘keeper Robert Green’s mistake. And after the Netherlands v. Japan match ended, I joined a seaside soccer game on one of Durban’s beaches. Each side had a motley mix of players, ranging from graying Japanese doctors to small boys who had flown in from Spain. The sun set on a scene that would have been unlikely at any other time, but was becoming commonplace during the World Cup. All the hype about soccer bringing people together? It’s not just wishful thinking. It’s real. SANTIAGO—When natural disasters only affect a few, their appearance in national memory is fleeting. A massive earthquake, 8.8 on the Richter scale, struck south-central Chile on Saturday, February 27th, close to 3 am in the morning local time. The disaster left vast parts of the country devastated, with hundreds of lives lost, coastal towns swallowed up by tsunamis, and hundreds of thousands left without food, water, power, or shelter. Widespread looting occurred in several cities, notably Concepcion, the nation’s second largest, and the historic colonial-era cores of several cities have utterly collapsed. As a Chilean myself, I understand how this earthquake changed the lives of all Chileans. But seeing all this destruction from New Haven, so far away, felt almost surreal to me. Watching the videos and looking at the photos made it seem like something out of a post-apocalyptic scenario. I’ve been here in Chile for the summer, and beyond some cracks on buildings and highways under repair, I haven’t really seen much destruction, since I’m far away from the most affected areas, and most shattered buildings had been cleared away or rebuilt in the months before I arrived. But I’ve heard some shocking stories from friends about the night of the quake and the chaotic days that followed. Sleeping in his grandparents’ house in the countryside south of Santiago, Cristobal Gomez, another university student, awoke when a wooden beam from the ceiling hit his head. The house was built of adobe, and though it had withstood a hundred years of earthquakes, rubble and dust started to fall everywhere. Unable to reach the door due to falling furniture, Cristobal was only able to get out of his room once the shaking stopped, allowing him to search for his family. A cloud of very dense dust had begun to spread throughout the shattered home, making him cough hard. “I found my uncle barely breathing,” said Cristobal, “and my grandmother up to her waist in rubble” in her room, whose roof had collapsed, making the night sky visible. His father, at his side by this point, also began fainting from the dust cloud. Cristobal knew that if he waited too long, he would faint as well, and with a burst of adrenaline began to kick open doors and windows, attempting to clear out the choking cloud. It worked, and with the help of his dad and uncle, Cristobal managed to liberate his grandmother. Getting out with only minor injuries, they saw the full extent of the damage, the house now left uninhabitable, with broken walls and a caved-in roof. A few days later, walking around the stunned city, Nicolas, another friend of mine, saw a somber icon of the disaster. The University of Chile Law School, where he studies, has a tall clock tower, and it lay still, marking 3:34, the time of the tragedy that shut down a nation. Chile will probably need years to recover. For some people, especially the better-off, life has returned to normal. But hundreds of thousands saw their lives changed irrevocably, their homes and livelihoods destroyed in a matter of minutes. The psychological aftermath was also significant – I heard stories of the panic in people’s eyes when aftershocks struck, for weeks after the big quake. I know Chile will rise to the challenge – it has done so before, and it stands united. There is a sense of optimism about the future, about not simply rebuilding, but improving what we had before. The painful memories of that late summer night, however, will serve as a stern reminder of the power of nature, of how everything can change in a mere three minutes. I have recently been exploring the development of an area in southwest Copenhagen that was once home to the manufacturing facilities of Carlsberg Breweries, one of the world’s largest brewery groups. The master plan for this site employs many of the latest ideas in the field of urban planning, seeming to serve as a model, at least on paper, for how the development of former industrial sites should proceed. Designed by Entasis Architects, a relatively small Copenhagen-based firm that won Carlsberg’s international ideas competition for the site’s development, the plan aims to transform this 74-acre site in extraordinary ways. The new city district will be compact, characterized by a variety of users and a variety of functions. Development will be transit-oriented, with plans to renovate and even relocate the nearest train station and with provisions for plenty of bicyclists and pedestrians (planners anticipate a transportation modal split somewhere around one-third motor vehicles, one-third public transport, and one-third cyclists and pedestrians). Public gathering spots and other shared areas will abound, and the spaces between buildings will receive more attention than will the buildings themselves. And the site’s beautiful historic buildings, many of which are legally protected by Denmark’s Heritage Agency, will be preserved and integrated almost seamlessly with the new construction. The site plan will modernize the medieval European-style compact city that has become so popular in today’s urban planning world. Of course, the development of the Carlsberg site has enjoyed incalculable advantages that have helped to make such a remarkable master plan possible. For one, rather than allowing the area surrounding its former manufacturing facilities to grow derelict, Carlsberg Breweries has played an active role in determining the future of the site. Plans for redevelopment began even before Carlsberg had transferred production to its new facilities, ensuring as smooth a transition as possible between industrial area and new city district. The site will continue to use the Carlsberg brand, ensuring not only the continued involvement of Carlsberg Breweries but also imbuing the area with 160 years of industrial history. And the site’s location in Copenhagen, a place where progressive planning ideas have become mainstream and where citizens tend to engage constructively in planning processes, certainly did not hurt. Perhaps most notably, Carlsberg has launched another ideas competition, this time to find suitable temporary public spaces to create and maintain vibrant city life during the interim period between industrial area and city district. Carlsberg’s developers have evidently realized that well-designed buildings and well-planned city blocks are worthless without people. The temporary public spaces are intended to inject life in the Carlsberg area from the beginning of the development process, to ensure that the district will have a long tradition of public life and social integration. Three proposals have been awarded a total of 7 million DKK (about $1.2 million USD) to construct 25,000 square meters of outdoor public facilities; the first of these spaces opened in June, and Carlsberg has already begun to promote a number of public events in the area. If the site’s master plan represents a “revolution” in modern city planning for its ability to translate age-old ideas into modern language, then the site’s temporary public spaces represent a revolution in the battle against urban decay. This initiative, combined with Carlsberg’s early involvement in the redevelopment process, suggests that it is possible to prevent industrial decay through masterful master planning and intelligent urban design. Yet the tragedy of the Carlsberg site is that it too may become another reminder that in the field of urban planning, as with so much else, money rules all. Construction has been stalled indefinitely, as developers recover from the financial crisis and recognize that their investment horizon may be much longer than initially anticipated. Developers have already begun to reevaluate whether relocating the nearby train station, once an integral component of the transportation plan for the area, is worth the enormous expense. It is unclear what will happen with the Carlsberg site, but it now seems unlikely that the master plan will be realized in its entirety. And so the Carlsberg project affords hard lessons about the reality of urban redevelopment projects. Even with all of the advantages in this case, Carlsberg’s developers have been unable to transition from master plan to on-the-ground reality. I do sincerely hope that they will manage to create something resembling Entasis’ plan; I would like to believe that it is possible to plan such an appealing, vibrant, magical urban space. 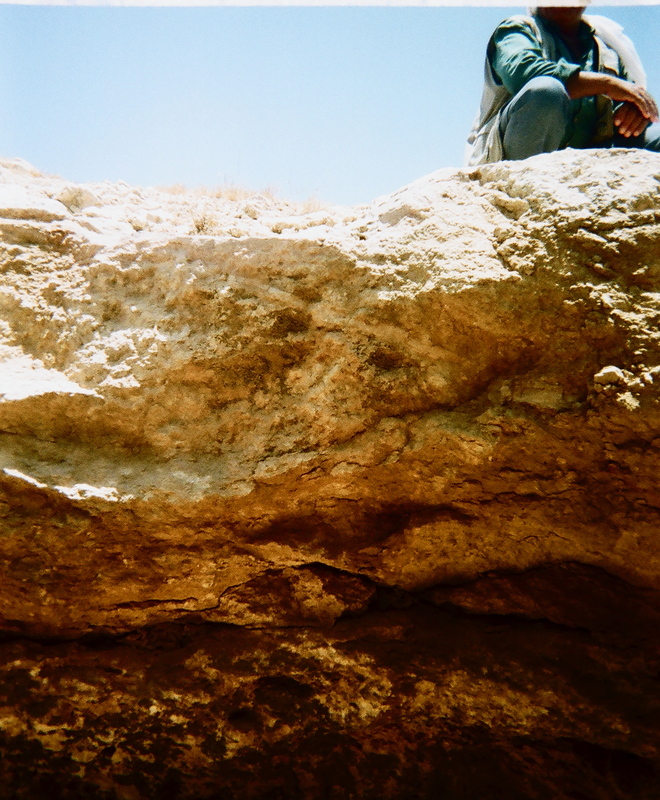 JERUSALEM – This past weekend, I headed to Cairo to see pyramids and ancient ruins. While I did gape at 5,000-year-old artifacts, look into the seemingly boundless Sahara desert, and float down the Nile, my touristy adventure couldn’t escape certain political surprises. Everywhere in Egypt, people speak of the war with Israel from October, 1973. In Israel, it is called the Yom Kippur War. In Egypt, it’s a national holiday. On October 6th, Egypt and Syria launched a surprise attack on Israel on Judaism’s most holy day, Yom Kippur. While I am no expert on the war, my impression of it from Israelis was that Egypt and Syria were able to get farther than usual due to the timing of their attack on the first day, and it was an intelligence mistake not to know and prevent the war before the attack that led to unnecessary casualties, but that within days Israel was able to take back the lead as usual. Almost three weeks after the attack, Israel was 40 kilometers from Damascus, and 101 kilometers from Cairo. The peace Israel eventually made with Egypt through the Camp David Accords and Israel’s giving back the Sinai is emphasized as an example of Israel’s concessions for peace. In Egypt, though, the war was a victory. Every Egyptian I spoke with brought up the war. Streets are named after October 6th. It was described to me multiple times as the most proud moment in modern Egyptian history. In the military museum, several murals and descriptions of the war would make one think that the Egyptians slaughtered and humiliated the Israelis. In descriptions, though, Israel’s name isn’t even mentioned. Allusions to the “phantom,” “the enemy,” and “the planes with blue stars” describe the apparently disgraced Israeli army as the valiant Egyptian army showed the world the courage of the Egyptian people, and won back the Sinai after the 1967 6-day war. While the reality probably lies somewhere in between the two narratives, I was struck by the overwhelming fanaticism with the war in Egypt. In Israel, it’s another war amongst the many in the past 60 years: the War of Independence in 1948, the Suez Campaign in 1956, the 6-day war in 1967, the Yom Kippur War in 1973, the 1982 Lebanon War, the First Intifada in 1987, the Second Intifada in 2000, the Second Lebanon War in 2006, and the Gaza War in 2008. As I received a huge hug from an Egyptian after saying that I knew about the victory of the 1973 war, I was inundated with the sense of the impossibility of objectiveness in this conflict. Maybe it’s the same with others as well, but Israel’s 60-year existence has been so densely filled with complicated events, not to mention the history stretching back at least 2,000 years, that one can pick facts to support almost any opinion. It’s impossible to not to have any opinion, I know that my interpretations of events is often clouded by fierce biases, but these systematic and dialectic viewpoints reveal the divides and lack of mutual understanding throughout the conflict. Egypt and Israel have made peace, but the vastly different narratives reveal a greater trend with Israel and all of its neighbors. These mass inconsistencies pose a threat to any sustainable peace, and put future generations on both sides in danger of growing extremism.